As a manufacturer of products for the home, we at Currey & Company use our “& Company blog” to share new releases, timeless treasures and long-standing popular products with our readers. 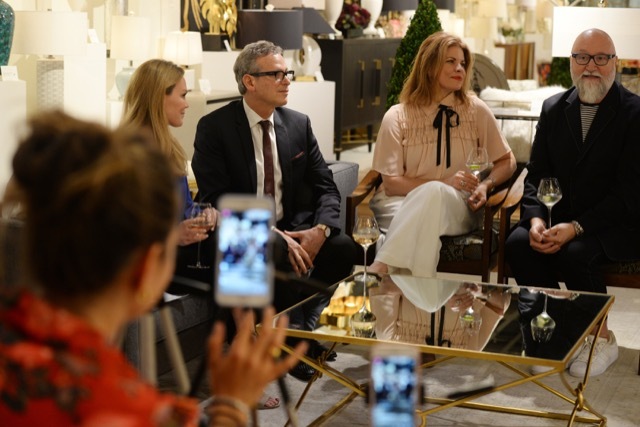 Some of the significant announcements we have made during the past several years include collaborations with the daughter of Phyllis Morris, whose poodle lamp and eyelash chandelier debuted during High Point Market. We launched a re-introduction of the Mid-Century Modern icon Edward Wormley with a number of his upholstered pieces. We also use these posts to highlight trends we are seeing, such as an abundance of gold, a proliferation of seashells or an array of organic shapes. We also like to note design styles we see cropping up, such as Industrial Chic and Mid-Century Modern. We strive to be a source for news and inspiration here on the Currey & Company blog but illustrating how our products are always in the mix. 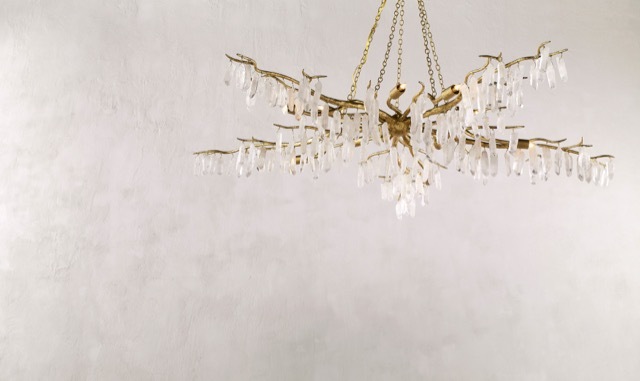 The Forest Light Chandelier by Aviva Stanoff. “For the eye has this strange property,” wrote Virginia Woolf: “it rests only on beauty; like a butterfly it seeks color and basks in warmth.” We are basking in the glow of our new product lineup as we ready the showrooms for the fall design markets. We just wrapped What’s New What’s Next to rave reviews for the sneak peek we offered attendees of our new designs by Denise McGaha, Barry Goralnick and our talented design team. Eye on WNWN: That’s a Wrap! Sandra Funk from the House of Funk in New Jersey conducts a lively interview with Barry Goralnick, Denise McGaha and Cecil Adams. As you can see from the shot above, we had a lively time. Sandra Funk from the House of Funk in New Jersey conducted a lively interview with Barry, Denise and Cecil Adams about the new collections we are debuting via Facebook LIVE, which ran on 3 channels. We were so happy to have Ranya Barrett, Sarah Harris and Sandra, the talented team from House of Funk, brighten up the showroom! We’ve always respected the eye they have for powerful design. We will soon be seeing all of you in our showroom during High Point Market with the beauty, color and warmth effervescing around us. 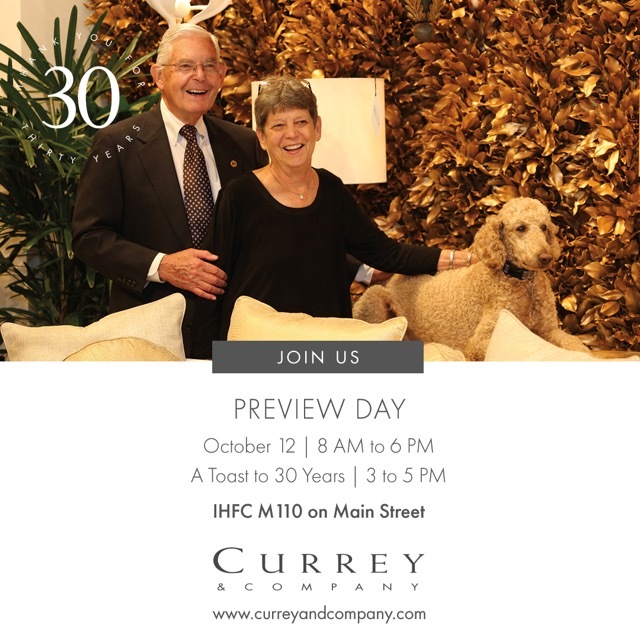 Join us at IHFC M110 on Main Street on Friday, October 12, for Preview Day from 8 a.m. to 6 p.m. to be the first to see our new products. We will toast our 30-Year Anniversary from 3 to 5 p.m. so come sip some bubbly with us to celebrate! We celebrate our new Barry Goralnick Collection. 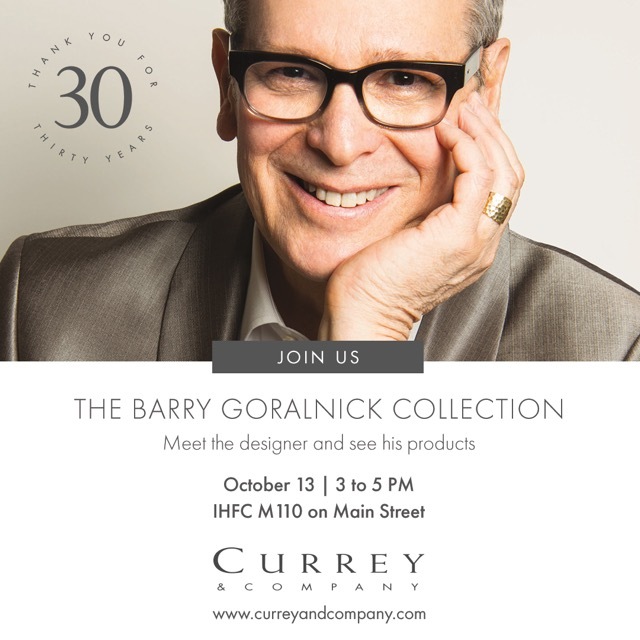 On Saturday, October 13, come by the showroom and meet designer Barry Goralnick and tour his new collection, which was developed with an eye to the architectonic. The new lighting he has designed includes the Blodgett Swing-Arm Wall Sconce below. Come raise a glass to this talent as we include him in our collaborative family! We launch The Denise McGaha Collection. On Sunday, October 14, from 3 to 5 p.m., we will celebrate the launch of The Denise McGaha Collection. The designer will be on hand to talk about her inspirations for her pieces and we’ll have libations and bites on hand so come for the fun! Join us as Jeffrey Dungan signs his new book. 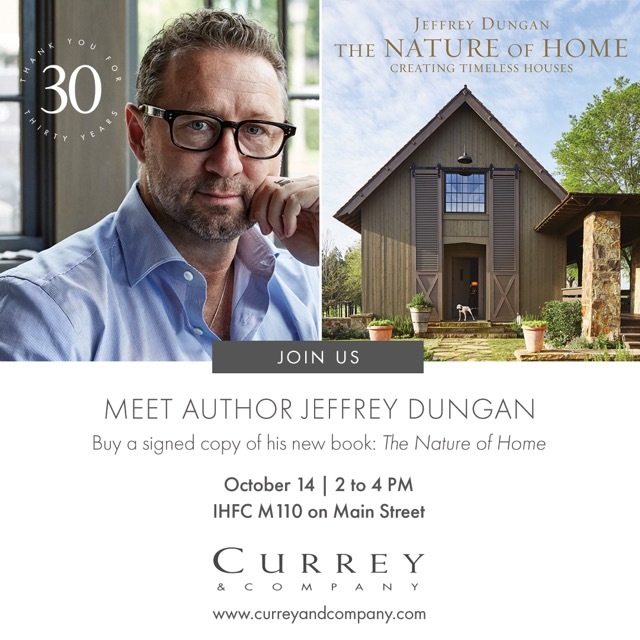 On Sunday, October 14, from 2 to 4 p.m., we have a book signing for Jeffrey Dungan’s new title The Nature of Home: Creating Timeless Houses. Come snag a copy of his beautiful book and meet the man whose eye for beauty emanates from its colorful pages. We’ll be pouring a little bubbly, of course, and serving up a bit of nourishment for all of you weary Market movers and shakers. Our new Chaumont Small Orb Chandelier. The Chaumont Small Orb Chandelier seems to be creating its shade as you watch, the frenetic vivacity of the lines unfurling in golden splendor. Made of wrought iron, the exterior is bathed in a luxuriant contemporary gold leaf finish while the inside of the bottom bowl that holds the light source has been treated to an acrylic white finish to give the illumination more oomph. The new Astrid Pendant designed by Denise McGaha. Flaunting its luminous aqua blue glass shade, the Astrid Pendant effervesces like bright sunlight striking the surface of the sea when the lights are switched on. Denise McGaha, who designed the pendant, chose the color of the glass to recall summer trips to the beach, her eye for vibrancy unerring. 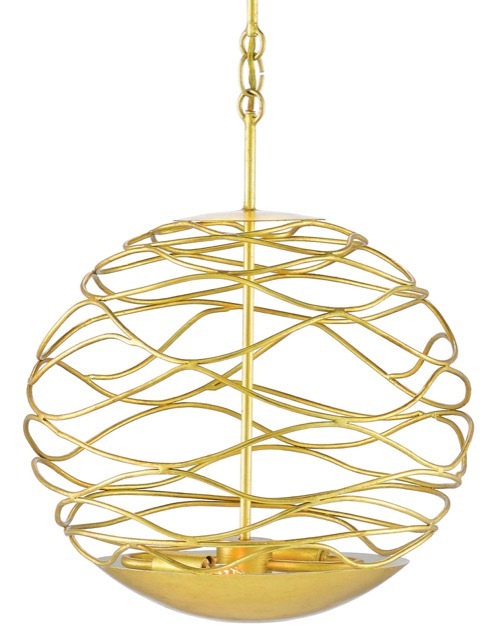 The circular orb cage surrounding it, in an antique brass finish, is a finely designed touch that lends the fixture’s profile a smart freshness. Place it over a kitchen island or a nightstand to add a joyful ambiance to the room. The new Blodgett Swing-Arm Wall Sconce designed by Barry Goralnick. 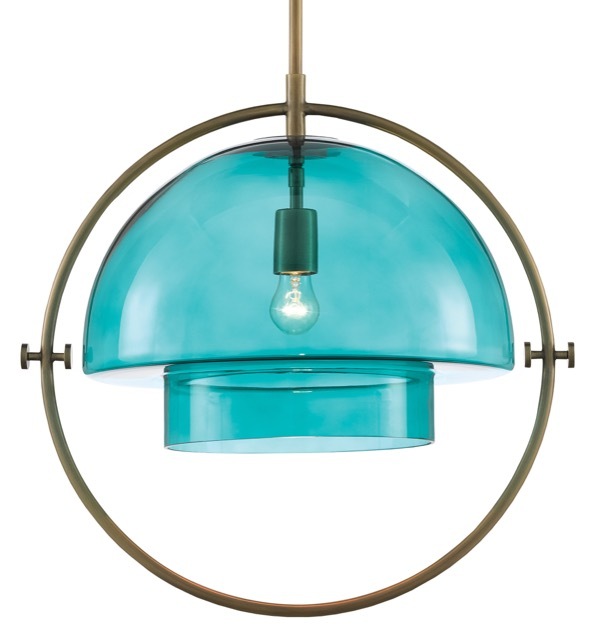 Is it the graceful shapes that make this fixture so elegant or the luminous turquoise color of the glass? 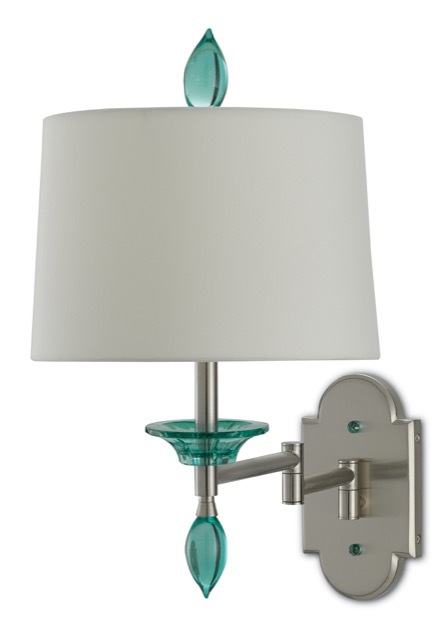 We are of a mind that it is both, our Blodgett Swing-Arm Wall Sconce so serene thanks to the elements that come together to create its bearing. The metal wallplate and hardware have been treated to a brushed nickel finish to make sure the metal doesn’t outshine the glass. In our Barry Goralnick Collection, the fixture’s final flourish is the fabric shade that fits this piece so perfectly. The new Figuier Mirror designed by Marjorie Skouras. Known for taking symbols from nature and turning them into the most exuberant of motifs, Marjorie Skouras has done it again with the Figuier Mirror. The leaves, made of cast aluminum in an antique brass finish with subtle green veining, seem so supple they are surely being stirred by a gentle breeze. The slender stems that dance along the edge of the mirrored surface create a playful pattern all their own. 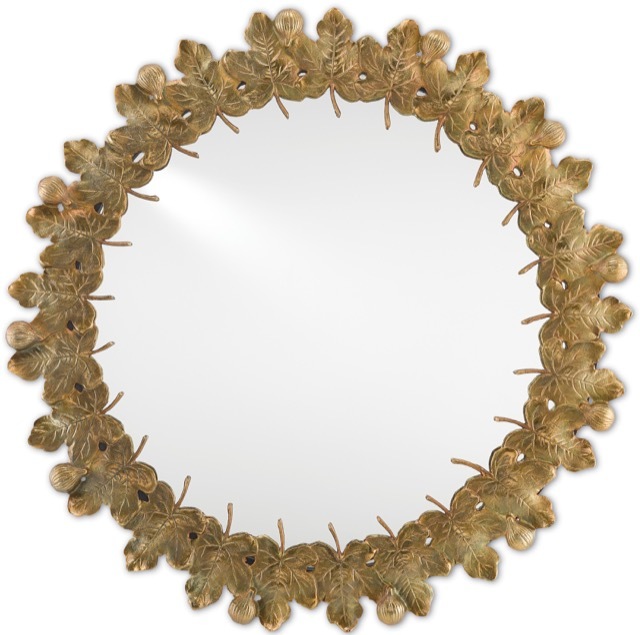 This decorative mirror will wow whether placed within a traditional setting or a classical backdrop. We’ve expanded our Briallen line with this Briallen Caviar Black Box designed by Aimee Kurzner. 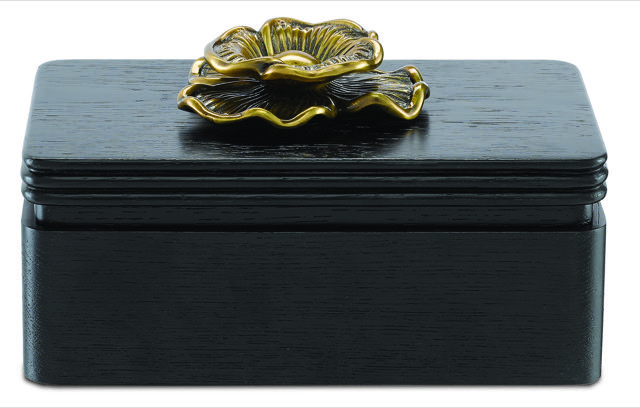 Stunning in its simplicity of lines and its artful hardware, the Briallen Caviar Black Box has an elegant Caviar-black stained wood and an impressively sized brass flower handle that steals the show. The stylized floral accent, which we’ve treated to an antique brass finish, also serves as a decorative element to make this box a bit of haute couture for a space. Place it on a dresser in a beautifully designed boudoir, on a coffee table or on a side table in a lovely den and watch it blossom in the space!We also offer this piece in a gray/silver combination. This lovely design and the Kallista Writing Desk below were created by Aimee Kurzner, Currey’s Director of Furniture. 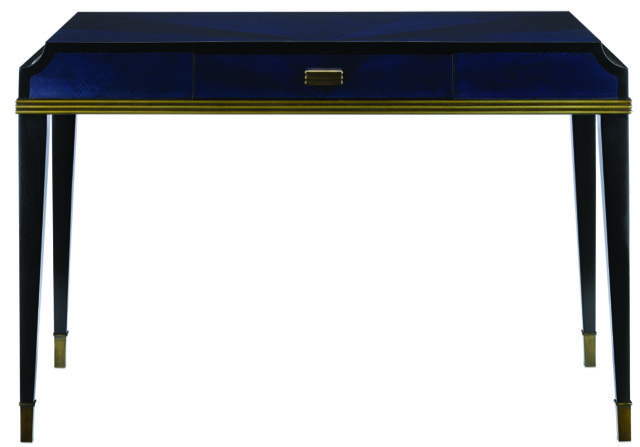 Aimee Kurzner also designed our new Kallista Writing Desk. Hello gorgeous is what everyone will be saying to the Kallista Writing Desk with its amped-up personality! The beauty of this piece has to do with the mix of dark sapphire and glossy caviar black finishes, which enliven the sycamore veneers, the woodgrain bringing the cabinet a hint of distressing. This is juxtaposed against the sleek lines of the piece that is made even more tailored by the antique brass detailing. To see all of these beauties in person, stop by and see us in High Point in our showroom at IHFC – M110, Main, Floor 1. We’re at shuttle stop 1 from the Transportation Terminal. 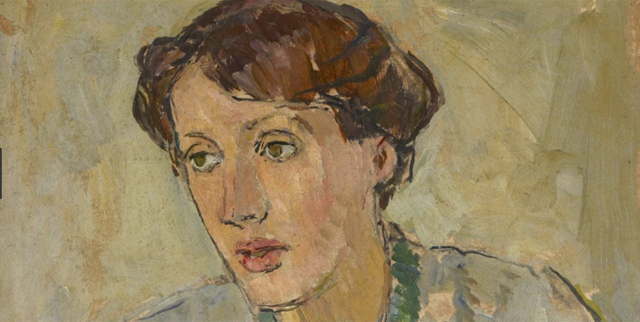 A portrait of Virginia Woolf painted by Vanessa Bell. Image courtesy Estate of Vanessa Bell/ Henrietta Garnett. Using her novelist’s eye, Woolf goes on to declare in her essay “Street Haunting,” “On a winter’s night like this, when nature has been at pains to polish and preen itself, it brings back the prettiest trophies, breaks off little lumps of emerald and coral as if the whole earth were made of precious stone.” We are not yet in winter but it is not far away. We look forward to showing you all our pretty trophies in a few weeks. Until then, we’ll be polishing and preening! This entry was posted in Currey & Company, Market, Products and tagged Accessories, book signing, Chandeliers, design influencers, Events, Furniture, Gold, Lighting, mirrors, organic shapes, Silver, Wall Sconce, writing desks on September 19, 2018 by Saxon Henry.